Lincoln is a 2012 American historical drama film directed and produced by Steven Spielberg, starring Daniel Day-Lewis as U.S. President Abraham Lincoln. The film also features Sally Field, David Strathairn, Joseph Gordon-Levitt, James Spader, Hal Holbrook, and Tommy Lee Jones in supporting performances. The screenplay by Tony Kushner was loosely based on Doris Kearns Goodwin's biography Team of Rivals: The Political Genius of Abraham Lincoln, and covers the final four months of Lincoln's life, focusing on his efforts in January 1865 to have the Thirteenth Amendment to the United States Constitution passed by the United States House of Representatives. The film was produced by Spielberg and frequent collaborator Kathleen Kennedy, through their respective production companies, Amblin Entertainment and the Kennedy/Marshall Company. Filming began October 17, 2011, and ended on December 19, 2011. Lincoln premiered on October 8, 2012 at the New York Film Festival. The film was co-produced by DreamWorks Pictures, 20th Century Fox, and Participant Media, and released theatrically by Touchstone Pictures in North America on November 9, 2012. The film was distributed by Fox in international territories. Lincoln received significant praise for the acting, especially Day-Lewis's performance, as well as Spielberg's direction, and production values. In December 2012, the film was nominated for seven Golden Globe Awards including Best Motion Picture – Drama, Best Director for Spielberg and winning Best Actor (Motion Picture – Drama) for Day-Lewis. At the 85th Academy Awards, the film was nominated for twelve Academy Awards including Best Picture and Best Director; it won for Best Production Design and Best Actor for Day-Lewis. The film was also a commercial success, grossing over $275 million at the box office. In January 1865, U.S. President Abraham Lincoln expects the Civil War to end soon, with the defeat of the Confederate States. He is concerned that his 1863 Emancipation Proclamation may be discarded by the courts after the war, and the proposed Thirteenth Amendment will be defeated by the returning slave states. He feels it imperative to pass the amendment beforehand, to remove any possibility that freed slaves might be re-enslaved. The Radical Republicans fear the amendment will be defeated by some who wish to delay its passage; support from Republicans in the border states is not yet assured. The amendment also requires the support of several Democratic congressmen to pass. With dozens of Democrats being lame ducks after losing their re-election campaigns in the fall of 1864, some of Lincoln's advisors believe he should wait for a new Republican-heavy Congress. Lincoln remains adamant about having the amendment in place before the war is concluded and the southern states readmitted. Lincoln's hopes rely upon the support of Francis Preston Blair, a founder of the Republican Party whose influence could win over members of the western and border state conservative faction. With Union victory in the Civil War highly likely, but not yet secured, and with two sons serving in the Union Army, Blair is keen to end hostilities. Therefore, in return for his support, Blair insists that Lincoln allow him immediately to engage the Confederate government in peace negotiations. Yet Lincoln knows that significant support for the amendment comes from Radical Republicans, for whom negotiated peace is unacceptable. Unable to proceed without Blair's support, Lincoln reluctantly authorizes Blair's mission. In the meantime, Lincoln and Secretary of State William Seward work to secure Democratic votes for the amendment. Lincoln suggests they concentrate on the lame duck Democrats, as they will feel freer to vote as they choose, and will also soon need employment; Lincoln will have many federal jobs to fill as he begins his second term. Though Lincoln and Seward are unwilling to offer monetary bribes to the Democrats, they authorize agents to contact Democratic congressmen with offers of federal jobs in exchange for their support. At a key moment in the debate, racial-equality advocate Thaddeus Stevens agrees to moderate his position and argue that the amendment represents only legal equality, not a declaration of actual equality. Meanwhile, Confederate envoys are ready to meet with Lincoln to discuss terms for peace, but he instructs they be kept out of Washington, as the amendment approaches a vote on the House floor. Rumor of their mission circulates, prompting both Democrats and conservative Republicans to advocate postponing the vote. But in a carefully worded statement, Lincoln denies there are envoys in Washington, and the vote proceeds, passing by a margin of just two votes. Black visitors to the gallery celebrate, and Stevens returns home to his "housekeeper" and lover, a black woman. When Lincoln meets with the Confederates, he tells them slavery cannot be restored, as the North is united for ratification of the amendment, and several of the southern states' reconstructed legislatures would also vote to ratify. On April 3, Lincoln visits the battlefield at Petersburg, Virginia, where he exchanges a few words with Lieutenant General Ulysses S. Grant. Six days later, Grant receives General Robert E. Lee's surrender at Appomattox Courthouse. On April 14, Lincoln is meeting members of his cabinet to discuss future measures to enfranchise blacks, when he is reminded that First Lady Mary Todd Lincoln is waiting to take them to their evening at Ford's Theatre. That night, while Lincoln's son Tad is watching Aladdin and the Wonderful Lamp at Grover's Theatre, the manager suddenly stops the play to announce that the President has been shot. The next morning Lincoln dies; Secretary of War Edwin Stanton declares, "Now he belongs to the ages". The film closes with a flashback to Lincoln delivering his second inaugural address. Gloria Reuben as Elizabeth Keckley, a former slave who was dressmaker and confidante to Mary Todd Lincoln. Tommy Lee Jones as Republican Congressman Thaddeus Stevens of Pennsylvania. A leader of the Radical Republicans and a fervent abolitionist, Stevens feared that Lincoln would "turn his back on emancipation." Hal Holbrook as Francis Preston Blair. Blair was an influential Republican politician who tried to arrange a peace agreement between the Union and the Confederacy. Holbrook had previously portrayed Lincoln in the 1976 miniseries Carl Sandburg's Lincoln and in the 1980s North and South miniseries. James Spader as Republican Party operative William N. Bilbo. Bilbo had been imprisoned but was freed by Lincoln, and then lobbied for passage of the Thirteenth Amendment. Julie White as Elizabeth Blair Lee. Lee was the daughter of Francis Preston Blair, and wrote hundreds of letters documenting events during the Civil War. S. Epatha Merkerson as Lydia Smith: Smith was Thaddeus Stevens' biracial housekeeper. Gregory Itzin as John Archibald Campbell. Campbell was a former Supreme Court Justice who had resigned at the start of war and then served as Assistant Secretary of War in the Confederate government. He was also a member of the Confederate delegation that met with Lincoln at the Hampton Roads Conference. While consulting on a Steven Spielberg project in 1999, Goodwin told Spielberg she was planning to write Team of Rivals, and Spielberg immediately told her he wanted the film rights. DreamWorks finalized the deal in 2001, and by the end of the year, John Logan signed on to write the script. His draft focused on Lincoln's friendship with Frederick Douglass. Playwright Paul Webb was hired to rewrite and filming was set to begin in January 2006, but Spielberg delayed it out of dissatisfaction with the script. Liam Neeson said Webb's draft covered the entirety of Lincoln's term as President. Tony Kushner replaced Webb. Kushner considered Lincoln "the greatest democratic leader in the world" and found the writing assignment daunting because "I have no idea [what made him great]; I don't understand what he did any more than I understand how William Shakespeare wrote Hamlet or Mozart wrote Così fan tutte." Kushner said Lincoln's abolitionist ideals made him appealing to a Jewish writer, and although he felt Lincoln was Christian, he noted the president rarely quoted the New Testament and that his "thinking and his ethical deliberation seem very talmudic". By late 2008, Kushner joked he was on his "967,000th book about Abraham Lincoln". Kushner's initial 500-page draft focused on four months in the life of Lincoln, and by February 2009 he had rewritten it to focus on two months in Lincoln's life when he was preoccupied with adopting the Thirteenth Amendment. Spielberg first approached Daniel Day-Lewis about the project in 2003, but Day-Lewis turned down the part at the time, believing the idea of himself playing Lincoln to be "preposterous". Liam Neeson was then cast as Lincoln in January 2005, having previously worked with Spielberg in Schindler's List. In preparation for the role, Neeson studied Lincoln extensively. However, in July 2010, Neeson left the project, saying that he had grown too old for the part. Neeson was 58 at the time, and Lincoln, during the time period depicted, was 55 and 56. In an interview with GQ Neeson stated that he realized during a table read that the part was not right for him in "a thunderbolt moment" and after the read requested that Spielberg recast his role. Co-star Sally Field, in a 2012 PBS interview, intimated that Neeson's decision was influenced by the death of his wife Natasha Richardson less than a year earlier. In November 2010, it was announced that Day-Lewis would replace Neeson in the role. While promoting Indiana Jones and the Kingdom of the Crystal Skull in May 2008, Spielberg announced his intention to start filming in early 2009, for release in November, ten months after the 200th anniversary of Lincoln's birth. In January 2009, Taunton and Dighton, Massachusetts were being scouted as potential locations. Spielberg arranged a $50 million budget for the film, to please Paramount Pictures CEO Brad Grey, who had previously delayed the project over concerns it was too similar to Spielberg's commercially unsuccessful Amistad (1997). Spielberg had wanted Touchstone Pictures – which agreed to distribute all his films from 2010 – to distribute the film, but he was unable to afford paying off Paramount, which had collaborated with DreamWorks on the film's development. Filming took place in Richmond, Fredericksburg, and Petersburg, Virginia. In reference to Petersburg, according to location manager Colleen Gibbons, "one thing that attracted the filmmakers to the city was the 180-degree vista of historic structures" which is "very rare". The Virginia State Capitol served as the exteriors and interiors of the U.S Capitol, and the exteriors of the White House. The House of Delegates inside the building was remodeled to fit for The House of Representatives Chamber set. Scenes representing Grovers Theatre were filmed in Fredericksburg, Virginia, at Virginia Repertory Theatre's November Theatre. John Williams composed and conducted the score. The score was recorded by the Chicago Symphony Orchestra and the Chicago Symphony Chorus. The soundtrack album was released by Sony Classical on November 6, 2012. All music was composed by Williams, except "Battle Cry of Freedom," which was written in 1862 by American composer George Frederick Root (1820–1895) during the American Civil War. Lincoln held its world premiere at the New York Film Festival on October 8, 2012. The film was also screened at the 2012 AFI Film Festival on November 8, 2012. Walt Disney Studios Motion Pictures distributed the film in North America through the Touchstone Pictures banner, while 20th Century Fox distributed the film in the remaining international territories. Disney Publishing Worldwide released several companion books and ancillary literature in anticipation of the film, including Lincoln: A Cinematic and Historical Companion and Lincoln: A Spielberg Film – Discover the Story. DreamWorks and Google Play released the film's trailer during a Google+ hangout with Spielberg and Joseph Gordon-Levitt on September 13, 2012. Then, on September 10, 2012, a teaser for the trailer was released. Lincoln was released by Touchstone Home Entertainment on Blu-ray, DVD, and digital download in North America on March 26, 2013. The film debuted at No. 1 in Blu-ray and DVD sales in its first week of release. Disney Educational Productions donated DVD copies of the film and a teaching guide titled Stand Tall: Live Like Lincoln to more than 37,100 secondary schools in the United States, after Spielberg received letters from educators requesting to incorporate the film into their curriculum. Lincoln earned $182,207,973 in North America from 2,293 theaters and $93,085,477 overseas for a total of $275,293,450, well exceeding its $65 million budget. The film had a limited opening in 11 theaters with $944,308 and an average of $85,846 per theater. It opened at the #15 rank, becoming the highest opening of a film with such a limited release. The film opened in 1,175 theaters with $21,049,406 and an average of $11,859 per theater. Due to the widespread success of Lincoln, Disney produced additional prints of the film to accommodate theater demand. Lincoln received worldwide critical acclaim. The cast was notably lauded, especially Day-Lewis, Field, and Jones. The film currently holds an 89% approval rating on the review aggregate website Rotten Tomatoes, based on 274 reviews with an average rating of 7.98/10, with the critical consensus "Daniel Day-Lewis characteristically delivers in this witty, dignified portrait that immerses the audience in its world and entertains even as it informs." On Metacritic, which assigns a rating out of 100 based on reviews from critics, the film has a score of 86 (out of 100) based on 44 reviews, indicating "universal acclaim", thus making it Spielberg's highest rated film on the site since Saving Private Ryan. Roger Ebert of the Chicago Sun-Times gave the film 4 out of 4 stars and said, "The hallmark of the man, performed so powerfully by Daniel Day-Lewis in Lincoln, is calm self-confidence, patience and a willingness to play politics in a realistic way." Glenn Kenny of MSN Movies gave it 5 out of 5 stars stating, "It's the most remarkable movie Steven Spielberg has made in quite a spell, and one of the things that makes it remarkable is how it fulfills those expectations by simultaneously ignoring and transcending them." Colin Covert of the Star Tribune wrote, "Lincoln is one of those rare projects where a great director, a great actor and a great writer amplify one another's gifts. The team of Steven Spielberg, Daniel Day-Lewis and Tony Kushner has brought forth a triumphant piece of historical journalism, a profound work of popular art and a rich examination of one of our darkest epochs." It was praised by Charlie McCollum of the San Jose Mercury News as "one of the finest historical dramas ever committed to film." Despite mostly positive reviews, Rex Reed of The New York Observer stated, "In all, there's too much material, too little revelation and almost nothing of Spielberg's reliable cinematic flair." However, the reviews have been unanimous in their praise of Day-Lewis's performance as Abraham Lincoln. A. O. Scott from The New York Times stated the film "is finally a movie about how difficult and costly it has been for the United States to recognize the full and equal humanity of black people" and concluded that the movie was "a rough and noble democratic masterpiece". Scott also stated that Lincoln's concern about his wife's emotional instability and "the strains of a wartime presidency... produce a portrait that is intimate but also decorous, drawn with extraordinary sensitivity and insight and focused, above all, on Lincoln's character as a politician. This is, in other words, less a biopic than a political thriller, a civics lesson that is energetically staged and alive with moral energy." Indian film critic/scholar M. K. Raghavendra says in Cinematic Illusions, "When a statesman is as well-regarded as a Lincoln or a Gandhi, it is impossible to be 'truthful' because a biopic, not being a documentary but an enactment, will be seen as being deliberately scurrilous unless its views agree with the dominant one. Where, in a biopic of a less venerated or more distant historical figure like a TE Lawrence or a Queen Elizabeth I, the director is allowed to become intimate with the subject, this is taboo when dealing with a Gandhi or a Lincoln. We identify with people who might have been as we are but a Gandhi and a Lincoln, at least by consensus, are too gigantic. It is an impiety for an actor to present us with Gandhi or Lincoln's 'true' thoughts and feelings. A way to get out of this bind is by showing us Gandhi before he became 'Gandhiji', Lincoln before he emerged as the epitome of greatness. John Ford's Young Mr. Lincoln (1939) and Shyam Benegal's The Making of the Mahatma (1996) employ the strategy. Rarely has any film combined both sides of such a colossus – the intimate and the monumental – because they belong to different genres." Lebanese film critic Anis Tabet gave the film a positive review, giving it a 3.5/4 rating. As reported in the Maariv newspaper, on February 3, 2013, Israeli Prime Minister Netanyahu and his ministers discussed Spielberg's film, which several of them saw in Israeli cinemas. They debated whether the end of abolishing slavery justified the means used by Lincoln, and also compared Lincoln's predicament with their own complicated situation in the confused aftermath of the 2013 Israeli elections. The review by The Daily Mail suggested: "The sad truth is that Spielberg and his writer Tony Kushner are offering a phoney, sanitised version of Lincoln." David Stewart, independent historical author, writing for History News Network, described Spielberg's work as "reasonably solid history", and told readers of HNN to "go see it with a clear conscience". Lincoln biographer Ronald White also admired the film, though he noted a few mistakes and pointed out in an interview with NPR, "Is every word true? No." Historian Joshua M. Zeitz, writing in The Atlantic, noted some minor mistakes, but concluded "Lincoln is not a perfect film, but it is an important film". Following a screening during the film's opening weekend, the Minnesota Civil War Commemoration Task Force held a panel discussion in which Dr. David Woodard of Concordia University remarked, "I always look at these films to see if a regular person who wasn't a 'Lincoln nut' would want to read a book about it after they watched the movie. I get the impression that most people who are not history buffs will now want to read something about Lincoln." Regarding the historical source material for Kushner's screenplay, legal historian Michael Vorenberg, a professor at Brown University and author of Final Freedom: The Civil War, The Abolition of Slavery, and the Thirteenth Amendment, noted several details throughout the film that "could only have come from [his] book." Among these details were specifics of dealings between Democrats and Thaddeus Stevens, the story behind securing Alexander Coffroth's vote and the fact that African Americans were present in the congressional galleries during the final vote. Ultimately, Kushner replied directly to inquiries from The New Republic writer Timothy Noah, explaining that while he had read Vorenberg's book and many others as research, he insists that Team of Rivals was his principal source material for the film. Lincoln was listed on many critics' top ten lists. ^ The Deadline Team (July 18, 2012). "Disney Dates Steven Spielberg's Lincoln Into Awards-Season Fray". ^ "LINCOLN (12A)". British Board of Film Classification. November 28, 2012. Retrieved November 28, 2012. ^ McClintock, Pamela (October 17, 2013). "DreamWorks' Stacey Snider Reveals How Studio Slimmed Down to Stay Alive". The Hollywood Reporter. Retrieved December 9, 2013. ^ a b c "Lincoln (2012)". Box Office Mojo. Retrieved April 28, 2013. ^ McClintock, Pamela (October 12, 2011). "Participant Media Boarding Steven Spielberg's 'Lincoln' (Exclusive)". The Hollywood Reporter. Los Angeles. Retrieved October 15, 2011. ^ "Filmmakers really liked Petersburg". The Progress-Index. Petersburg, Virginia. December 29, 2011. Archived from the original on November 25, 2012. Retrieved January 22, 2012. ^ Fischer, Russ (November 19, 2010). "Daniel Day-Lewis to Star in Steven Spielberg's Lincoln". /Film. ^ a b McClintock, Pamela (January 23, 2012). "Fox Partnering with DreamWorks on Steven Spielberg's 'Lincoln'". The Hollywood Reporter. Archived from the original on July 1, 2014. Retrieved June 18, 2014. ^ Fischer, Russ (November 19, 2010). "Daniel Day-Lewis to Star in Steven Spielberg's Lincoln". /Film. Retrieved June 28, 2011. ^ Chitwood, Adam (April 13, 2011). "Sally Field Set to Play Mary Todd Lincoln in Steven Spielberg's LINCOLN". Collider.com. Retrieved June 28, 2011. ^ a b c d e f g h i j "Spielberg's Lincoln Casts Every Other Good Actor Under The Sun". Retrieved November 25, 2011. ^ a b Goetz, Barrett (May 5, 2011). "Tommy Lee Jones & Joseph Gordon-Levitt Join Spielberg's Lincoln". TheMovieMash.com. Retrieved June 28, 2011. ^ Labrecque, Jeff (November 28, 2011). "'Lincoln': Meet the Cast". Entertainment Weekly. Retrieved December 1, 2011. ^ a b c d e f g h i j k l m n o p q Lipton, Brian Scott (November 28, 2011). "Steven Spielberg's Lincoln Announces Additional Casting". TheaterMania.com. Retrieved November 28, 2011. ^ "Lincoln (2012) : Full Cast & Crew". IMDb.com. Retrieved July 27, 2016. ^ "David Oyelowo Joins Steven Spielberg's Lincoln". Retrieved November 24, 2011. ^ Joshua L. Weinstein (June 27, 2011). "David Strathairn Joins DreamWorks' 'Lincoln'". TheWrap.com. Retrieved June 28, 2011. ^ Jeanne Jakle (July 30, 2011). "Jeanne Jakle: McGill's profile going higher and higher". mysanantonio.com. Retrieved July 30, 2011. 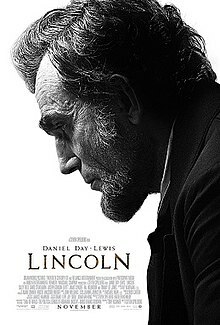 ^ a b c d "Lincoln (2012) - Full cast and crew". Imdb.com, Inc. Retrieved April 8, 2013. ^ Goodwin, Doris Kearns (2006). Team of Rivals. Simon & Schuster. pp. 686–754. ISBN 978-0-7432-7075-5. ^ "Walton Goggins Joins Cast Of Lincoln". Deadline Hollywood. July 11, 2011. Retrieved November 28, 2011. ^ "Tim Blake Nelson tapped for Spielberg's 'Lincoln' film in 2012". Retrieved November 25, 2011. ^ Vincent, Mal (October 14, 2011). "Spielberg's 'Lincoln' takes Richmond". The Virginian-Pilot. Norfolk, Virginia. Archived from the original on October 15, 2011. Retrieved October 15, 2011. ^ a b Ruben V. Nepales (May 18, 2008). "Spielberg may co-direct next with Peter Jackson". Philippine Daily Inquirer. Archived from the original on May 18, 2008. Retrieved May 18, 2008. ^ a b c Michael Fleming (January 11, 2005). "Lincoln logs in at DreamWorks: Spielberg, Neeson eye Abe pic". Variety. Retrieved January 24, 2007. ^ "Logan Scripting Spielberg's Lincoln". IGN. December 7, 2001. Archived from the original on January 3, 2013. Retrieved July 21, 2008. ^ "Lincoln Update". IGN. January 23, 2003. Archived from the original on December 13, 2010. Retrieved July 21, 2008. ^ Ron Grover (April 17, 2006). "The Director's Cut". BusinessWeek. Retrieved August 10, 2007. ^ a b Jeffrey Wells (February 2, 2009). "Spielberg's Lincoln in December?". Hollywood Elsewhere. Archived from the original on February 12, 2009. Retrieved February 10, 2009. ^ Naomi Pffefferman (October 25, 2007). "Kushner's (old) testament to Lincoln". The Jewish Journal of Greater Los Angeles. Retrieved November 22, 2008. ^ Karen Bovard (November 20, 2008). "Lincoln Logs". Hartford Advocate. Retrieved November 23, 2008. ^ "Abraham Lincoln As You've Never Heard Him Before". The New York Times. Retrieved July 27, 2016. ^ Max Evry (January 24, 2007). "Liam Neeson Talks Lincoln". ComingSoon.net. Retrieved May 12, 2008. ^ Simon Reynolds (July 30, 2010). "Neeson quits Spielberg's Lincoln biopic". Digital Spy. ^ Hainey, Michael. "The GQ Cover Story: Liam Neeson". GQ. p. 3. Retrieved January 12, 2015. ^ "Actress Sally Field, Part 1". Tavis Smiley. Season 9. November 15, 2012. 08:00 minutes in. PBS. Archived from the original on November 22, 2012. Retrieved January 11, 2013. ^ Tom Chiarella (February 15, 2011). "The Hard Luck and Beautiful Life of Liam Neeson". Esquire. Hearst Communications. Retrieved January 11, 2013. ^ Shoard, Catherine (November 19, 2010). "Daniel Day-Lewis set for Steven Spielberg's Lincoln film". The Guardian. Retrieved November 19, 2010. ^ Sheigh Crabtree (May 10, 2008). "Steven Spielberg: He wants to shoot 'Abraham Lincoln' in 2009". Los Angeles Times. Retrieved May 10, 2008. ^ Charles Winokoor (February 7, 2009). "Film crews may be back in Silver City". Taunton Daily Gazette. Retrieved February 10, 2009. ^ Kim Masters (February 17, 2009). "Spielberg's Lincoln Troubles". Slate. Retrieved February 18, 2009. ^ Wiggins, F.M. (November 17, 2011). "Lincoln film to come to Petersburg next month". The Progress-Index. Petersburg, Virginia. Archived from the original on November 28, 2011. Retrieved November 28, 2011. ^ "IMDb> Lincoln (2012)> Filming locations". imdb.com. Retrieved July 27, 2016. ^ "John Williams' Tracklist For Score To Steven Spielberg's 'Lincoln' Is Suitably Important & Historical". Retrieved August 27, 2012. ^ "John Williams' Lincoln Score Gently Spoils A Few Key Scenes". Retrieved September 30, 2012. ^ Finke, Nikki (October 4, 2012). "Surprise: Steven Spielberg's 'Lincoln' To Premiere Monday At New York Film Festival". Deadline Hollywood. Retrieved May 28, 2014. ^ Chan, Stephanie (November 9, 2012). "Steven Spielberg Receives Standing Ovation at 'Lincoln' L.A. Premiere". The Hollywood Reporter. Retrieved May 28, 2014. ^ Henderson, Jane (November 16, 2012). "A few books tied to Spielberg's 'Lincoln'". St. Louis Post-Dispatch. Retrieved February 14, 2013. ^ "Lincoln Google Hangout and Trailer Premiere Announced for September 13th". ComingSoon.net. Los Angeles, CA. September 4, 2012. Retrieved September 4, 2012. ^ "Take a Sneak Peek at Steven Spielberg's Lincoln Trailer". ComingSoon.net. Los Angeles, CA. September 10, 2012. Retrieved September 10, 2012. ^ Justin Sluss (January 10, 2013). "Steven Spielberg's Oscar nominated Lincoln comes to Blu-ray in March". Archived from the original on January 12, 2014. Retrieved April 8, 2013. ^ "'Lincoln' top DVD and Blu-ray seller; 'Argo' top rental". The Los Angeles Times. April 8, 2013. Retrieved April 24, 2013. ^ Ford, Rebecca (February 11, 2013). "'Lincoln' DVDs to Go to All U.S. Middle and High Schools". The Hollywood Reporter. Retrieved March 30, 2013. ^ "Disney will give "Lincoln" DVD to every middle, high school in U.S." The Denver Post. February 12, 2013. Retrieved March 30, 2013. ^ Solis, Liana (February 18, 2013). "Disney announces it will donate Lincoln movie to schools". The Daily Toreador. Retrieved March 19, 2013. ^ Lang, Derrick (December 3, 2012). "'Lincoln' Box Office So Strong, Disney Having Hard Time Keeping Up With Demand". The Huffington Post. Retrieved January 12, 2013. ^ "Lincoln". Rotten Tomatoes. Retrieved January 3, 2013. ^ "Lincoln". Metacritic. Retrieved November 21, 2012. ^ "Roger Ebert's review of Lincoln". Retrieved November 15, 2012. ^ "Review by Glenn Kenny (MSN Movies)". Retrieved January 3, 2013. ^ "Making history with 'Lincoln'". Retrieved January 11, 2013. ^ McCollum, Charlie (November 7, 2012). "Review: An epic 'Lincoln'". San Jose Mercury News. ^ a b Scott, A. O. (November 8, 2012). "A President Engaged in a Great Civil War". The New York Times. Retrieved November 9, 2012. ^ Raghavandra, M. K. (September 2, 2018). "Lincoln". Cinematic Illusions. ^ anistabet (January 13, 2013). "Lincoln  | Let's tlk abt movies". Tlkabtmovies.com. Retrieved February 23, 2013. ^ "Lincoln's Use of Politics for Noble Ends". NYTimes.com. November 26, 2012. Retrieved December 4, 2012. ^ Kate Masur (November 12, 2012). "In Spielberg's Lincoln, Passive Black Characters". NYTimes.com. Retrieved December 4, 2012. ^ Harold Holzer (November 22, 2012). "What's True and False in Lincoln Movie". The Daily Beast. Retrieved December 4, 2012. ^ Barry Bradford. "Is the Lincoln Movie Historically Accurate?". ^ Frum, David (November 27, 2012). "A Civil War Professor Reviews 'Lincoln'". The Daily Beast. Retrieved December 4, 2012. ^ "Understanding Lincoln: An interview with historian Allen Guelzo". World Socialist Web Site. Retrieved April 15, 2013. ^ David O. Stewart (November 20, 2012). "How True is "Lincoln"? | History News Network". Hnn.us. Retrieved December 4, 2012. ^ Updated: Nov 23, 2012 04:49 PM EST (November 23, 2012). "Fact-Checking Steven Spielberg's 'Lincoln' Movie with Biographer Ronald C. White : Books : Books & Review". Booksnreview.com. Retrieved December 4, 2012. ^ "Fact-Checking 'Lincoln': Lincoln's Mostly Realistic; His Advisers Aren't – Joshua Zeitz". The Atlantic. Retrieved December 4, 2012. ^ "Panel Discussion for the film LINCOLN". This Week in the Civil War. January 16, 2013. Retrieved February 23, 2013. ^ Vorenberg, Michael (May 2001). "Final Freedom by Michael Vorenberg". Cambridge Core. Retrieved January 28, 2019. ^ a b Noah, Timothy (January 10, 2013). "Tony Kushner's Real Source For "Lincoln"?". The New Republic. ISSN 0028-6583. Retrieved January 28, 2019. ^ Noah, Timothy (January 11, 2013). "Kushner Replies About Sources". The New Republic. ISSN 0028-6583. Retrieved January 28, 2019. ^ "Film Critic Top 10 Lists - Best of 2012". Metacritic. Retrieved July 27, 2016. Mitchell, Mary Niall. "Seeing Lincoln: Spielberg's Film and the Visual Culture of the Nineteenth Century," Rethinking History 19 (Sept. 2015), 493-505. Dimock, Wai Chee (Winter 2013). "Crowdsourcing History: Ishmael Reed, Tony Kushner, and Steven Spielberg Update the Civil War". American Literary History. 25 (4): 896–914. doi:10.1093/alh/ajt044.